Another ClassJuggler Upgrade – Always Improving! With the release today of ClassJuggler v7.0.2 – which, as always, happens automatically for you (one of the big advantages of using an online service for your class-based business management software) — you, our customers, can expect to see many subtle but helpful changes. Bounce Back is a new feature that allows you to navigate away from certain screens in ClassJuggler to do actions related to a given workflow or set of steps and then easily “bounce back” to where you were prior to taking that action. What it will look like: A new Bounce Back button will appear on those related screens. Clicking the Bounce Back button teleports you all the way back to what you were doing before you started this offshoot action, automatically saving any changes or options/selections you made. Over time, we will likely add the Bounce Back buttons in many places. 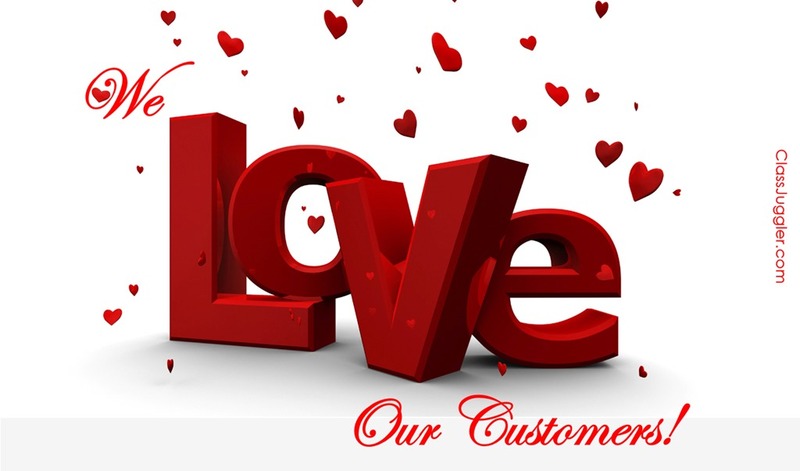 Initially, you will see the feature from a Customer Portal order to a customer’s account, or to sending a confirmation statement to the customer, and then return back to the original order. We mentioned this in our last release. Now, it will be available to all clients. What you will see: You’ll see a new batch payment option on the Batch Payment Processing screen, which will give you much greater control over what types of transactions you will collect payments for when processing batch payments. Clicking the new SELECTED CHARGE ACCOUNTS button takes you to an intermediary screen where you select one or more accounts to include in the batch payment run. if on this intermediary screen you select to, say, only collect on the charge accounts for “Tuition” and “Competition Fee,” only those types of charges would be paid. Example: Let’s say, in this scenario, that a customer has a balance due of $400.00. This includes $100 in tuition, $40 for registration fees, $60 for merchandise, and $200 for competition fees. After running the batch payment collection, this customer’s credit card would only be billed for $300 –- the $100 in tuition and $200 in competitions fees on their account. The remaining charges on their account would stay unpaid. Customer Portal: Customer Policies – Added a second tab to the Customer Policies screen for viewing archived policies. Customer > Maintenance Page 1 – The “auto-balance” feature has been removed. Customer > Maintenance Page 2 – The section displaying Policies & Agreements has been modified with tabs to allow viewing of only current or archived policies. Customer > Transactions – Created a quick link to the Pre-Pay Billing screen from the Help and Tips Menu. The current customer will be selected when arriving at the pre-pay billing screen. Student > Maintenance Page 2 – The section displaying Policies & Agreements has been modified with tabs to allow viewing of current or archived policies. Events > Event Template Maintenance – Added more information to the description of policies when they are added to an event. Billing > Auto-Balance Manager – This no-longer-needed feature has been removed. Reports > Customer > Policies and Agreements – Report updated to allow for reporting on both current and archived policies. The policy selector now contains two sections for selecting current or archived policies. The selector also now notes the policy title, who it applies to, if mandatory or optional, and the ID# of the policy. Tools > Customer Portal Orders: Pending Orders – The way orders are processed and reviewed now is much easier to see incoming pending orders by the customer (family) placing the order. This allows you to process an entire order as a unit rather than in bits and pieces as it was done in the past. Other new features on the pending orders includes special customer actions with the new “Bounce Back” feature. Tools > Customer Portal Orders: Historical Orders – The new Historical Orders screen make it much easier to review historical orders by the customer (family) who placed the order, now showing color-coded statistics about the order and which class requests were approved, wait listed, or canceled. Other new features on historical orders includes special customer actions with the new “Bounce Back” feature. Tools > Customer Portal Orders: Items In Shopping Carts – The presentation of items in shopping carts (not checked out) has also been updated, now linking to a customer record, and shows a selected class as the item. Tools > Web Site Tools > Shopping Cart Manager > Pending Classes > Enroll in Class – We improved the way pending orders are compared for priority when processing an order. Preferences > Policies – The copy of the Policies screen has been improved, and now shows how a policy is used throughout ClassJuggler. The ID of the policy is also displayed for easier identification of a policy. Preferences > Advanced Settings – Removed the option for customer defaults to be auto-balance, as it is no longer needed in the current version. Several other minor bugs were fixed. This entry was posted in Cheer ClassJuggler, ClassJuggler Dance, ClassJuggler Dojo, ClassJuggler Fitness, ClassJuggler for Franchises, ClassJuggler K-12, Music ClassJuggler, Product Info, Swim ClassJuggler on January 26, 2018 by classjuggler. Winter Storm-Related Outage? Business Text to the Rescue! A common scenario every winter: a sudden dump of snow makes roads impassable or dangerous. Or a sudden temperature drop during a rainstorm ices over the roads to your school or other class-based business. You need to get the word out FAST that one or several classes are canceled or delayed. But how? There’s an easy way: ClassJuggler’s built-in texting tool! This highly customizable tool makes it easy to get timely SMS (text) messages to all or a subset of your customers. And you can filter your text message recipient list by certain attributes so that it only goes to the right audience for your message. 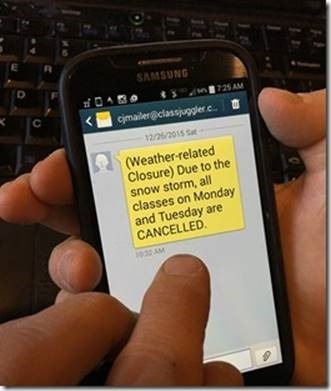 It’s important to pinpoint your audience not only because it makes your messages more likely to be appreciated but because the mobile device owners for whom that message is not important (such as those who don’t have classes the week of your cancellation) may get frustrated enough to block their phone from receiving messages from you. You can also use our robust ClassJuggler Help to learn all about SMS Messaging. And here’s some extra good news; while some of our competitors charge per message for their clients to use their messaging tool, the SMS messaging tool is totally free to ClassJuggler customers, no matter how many students you have. But wait – I’m not a ClassJuggler client yet! Or simply contact us directly and we can answer your questions. This entry was posted in Cheer ClassJuggler, ClassJuggler Dance, ClassJuggler Dojo, ClassJuggler Fitness, ClassJuggler for Franchises, ClassJuggler K-12, Music ClassJuggler, Product Info, School Management Tips, Swim ClassJuggler on December 21, 2017 by classjuggler. The new Customer Portal from ClassJuggler can change the way you do business, and change the way your customers view you! Learn more. This entry was posted in Cheer ClassJuggler, ClassJuggler Dance, ClassJuggler Dojo, ClassJuggler Fitness, ClassJuggler for Franchises, ClassJuggler K-12, Music ClassJuggler, Product Info, Swim ClassJuggler on December 18, 2017 by classjuggler. First, you’ll see a new privilege has been set up for the new Database Maintenance tool. Clicking the new button takes you to a secondary screen where you will select one or more accounts that will be included in the batch payment run. For example, if you select to only collect on the charge accounts for “Tuition” and “Competition Fee,” only those types of charges get paid. Let’s say a customer has a balance due of $400.00. This includes $100 in tuition, $40 for registration fees, $60 for merchandise, and $200 for competition fees. After running the batch payment collection, this customer’s credit card would only be billed for $300: the $100 in tuition and $200 in competitions fees on their account. The remaining charges on their account would stay unpaid. The measurements tool allows an administrator to reset all student measurements so that they can be entered fresh. The Customer Balance Re-Calculator tool allows an administrator to verify and re-calculate all customer balances in order to fix any balances in error (rare, but it can happen). Home Base – We’ve added two new alerts to the Action Center: Customer Portal migration alert (temporary alert to assist with migration notifications), and Customer Portal Fixed Registration End Date alert (which will tell you if your fixed end date is in error or expired). Customer Portal – We made minor improvements to wording in field labels and help screens to clarify information. Customer Portal > Billing > Make a Payment – Customers can now provide their own payment descriptions. A default description will appear but can be edited by the customer. Transaction ID from the gateway. Customer Portal payments now also have a second description always coded “Customer online card payment” for ease of identification. If a class has not yet started, it will select the first class date as the attendance date instead of selecting the current day and time. Manage attendance now checks to make sure you do not attempt to add attendance entries before the class begin date and time or after the class end date and time. This also works when adding special attendance entries like Try-Outs (Drop-In) and Make-Ups. We’ve expanded the class date selector to show up to 24 weeks of classes surrounding the current date (up from 12). Student > View Attendance – Expanded the initial period viewed from 1 month to 12 months. You can also now view up to three years at a time of special attendance entries. Billing > Customer Payments: Manual – Clicking on a customer row with a future balance now only populates the current balance due in the amount field instead of the current + future balance amounts. 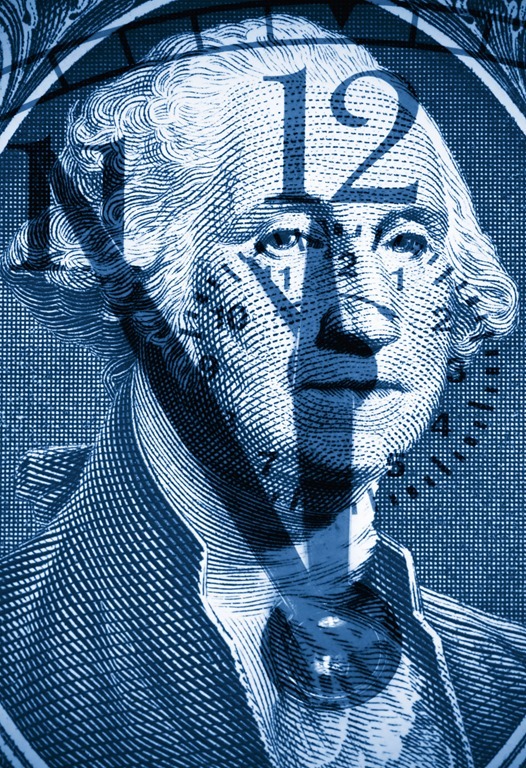 This is to help prevent payments being made against future transactions which causes the display and calculations for a customer account to display incorrect information. Billing > Customer Payments: Batch – We removed the option to collect balances based on future balances. This was causing balances to be displayed incorrectly, based on how the payments were applied. A change to how payments are made against future transactions will be made in a later upcoming release. Tools > Customer Portal Manager – We added edits for the Sign In Page address and social media links to ensure the URL is a valid web address. Updated the online help menu to display all text in green to follow the interface coloring standards for help. Restyled the help menu to be smoother for high resolution retina displays. Began process of replacing help menus on all screens with new version. We hope you enjoy the new enhancements! If you have questions about any of these, please feel free to contact us, and we can walk you through the relevant new processes. This entry was posted in Cheer ClassJuggler, ClassJuggler Dance, ClassJuggler Dojo, ClassJuggler Fitness, ClassJuggler for Franchises, ClassJuggler K-12, Music ClassJuggler, Product Info, Swim ClassJuggler on December 11, 2017 by classjuggler. 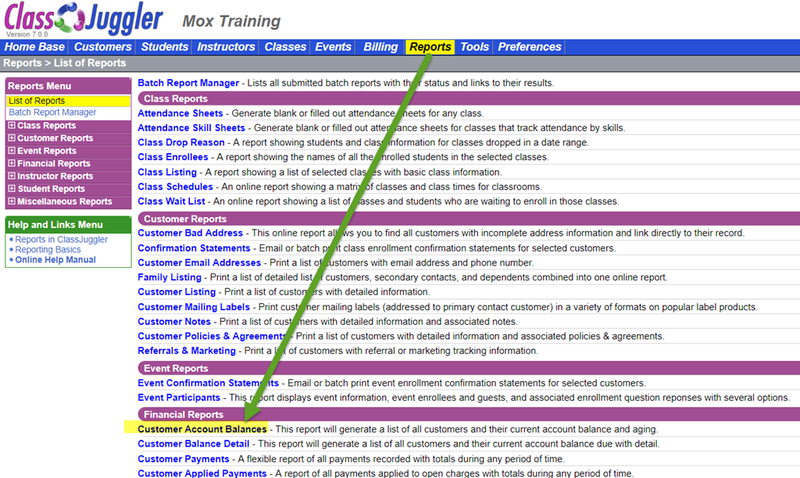 Did you know that you can run a report in ClassJuggler to quickly list your Customer Account Balances? The report, which you can generate as a PDF or as a .CSV file (for easy importing into Microsoft Excel) generates a list of all customers and their current account balance and aging. To only list customers with balances, click the Only show customers with balances due checkbox, and then enter a balance amount of $0.00 or more in the Balances Greater Than field. Select either All Accounts or choose a specific Aging period for customer balances. If you want to also include all lower level aging or all higher level aging, select the appropriate option. Select “All” or a specific Pay Group to report on. Select “All” or a specific Status of customers to report on. Select “All” or a specific Category of customers to report on. Click Generate Report to run the report. 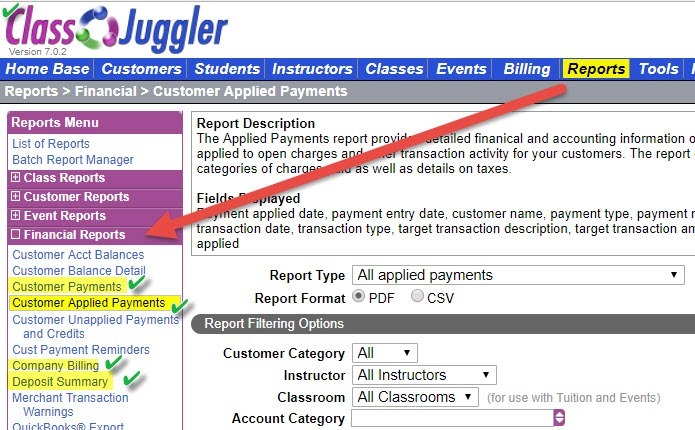 To get information on this report, here’s the direct link to the Customer Account Balances help page, which you can access from within your ClassJuggler login. Here’s a good overview of the report types you can run with ClassJuggler as your class-based business management software, such as dance studios, swim schools, martial arts dojos, gymnastics centers, cheer camps, and more. This entry was posted in Cheer ClassJuggler, ClassJuggler Dance, ClassJuggler Dojo, ClassJuggler Fitness, ClassJuggler for Franchises, ClassJuggler K-12, Music ClassJuggler, Product Info, Swim ClassJuggler and tagged class management software, class-based businesses software on October 12, 2017 by classjuggler.